Последний день лета / Last Day of Summer. 1984. - 27 Января 2018 - KinoSalon. Главная » 2018 » Январь » 27 » Последний день лета / Last Day of Summer. 1984. This rarely seen television film was one of the first dramas to be shown on Channel 4 in Britain. Brothers Tom and Pete live in their late parents' sprawling home deep in the English countryside on the banks of the River Thames. 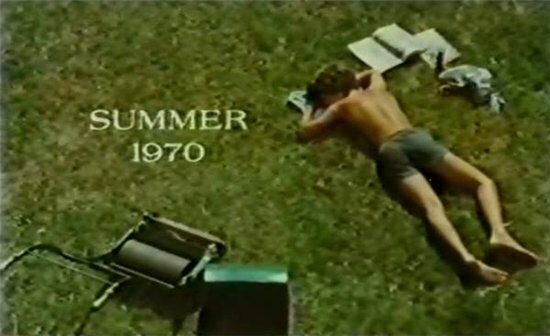 Pete, being old enough to inherit the house, decides to open it as a commune, in keeping with his hippie leanings, and reflecting the era in which the film is set, and when a vacancy occurs he decides to take the first person who applies. Jenny, played by Annette Badland, then joins the commune completing the diverse range of characters. Initially her plain looks and shy personality are the subject of some ridicule from the others, but soon her warmth and kindness wins everybody over, and she and young Tom, who is still a boy grieving for his parents and obviously lonely amongst a houseful of adults, form a strong bond. Jenny become a big sister for Tom, and Tom shows suburbanite Jenny the wonders of the countryside in the full bloom of high summer. They spend time picnicking and boating on the river in Tom's boat, and the summer passes lazily by until the last day of the school holidays when the drama begins. Just about everything in this film is pretty near perfect. The acting is sensitive and credible, the haunting piano score is spot on and the attention to detail is breathtaking - the posters on the wall of Tom's bedroom are obviously genuine 1960s articles. But it is the cinematography that really shines. Rarely has the Berkshire countryside looked more lush, and the interiors are moodily lit, with shafts of sunlight peeking through both the permanently closed heavy curtains and the marijuana smoke. Cast: Annette Badland, Graham McGrath, James Gaddas, Christine Winter, John Telfer, Saskia Reeves. Download Последний день лета / Last Day of Summer.